﻿﻿Recognised for her outstanding contribution to water sports & Triathlon. Ann Fowler is finally being recognised for her unique sporting record that saw her represent New Zealand in four codes. At Upper Hutt College, Ann Jackson, as she was known then, was selected to represent New Zealand at waterpolo. Within five years she was the national captain. She also represented New Zealand in marathon swimming (winning the Australian long-distance title) and surf lifesaving. Despite a busy schedule she won numerous national life saving titles. After having a family, which includes professional footballer Dan Keat, she took up triathlons and came 13th at the 1994 World Championship. At the same world champs she won a silver medal in the team's event. In 19th place was another local great, Jill Westenra. Triathlon was just emerging as a professional sport and at the world champs, she earned her first cheque, $1300. Remarkably, Fowler' s main sport at college was competitive swimming, which she competed in with success at a national level. Upper Hutt did not have a pool and she had to go to Tawa, where she met members of the Paekakariki Surf Lifesaving Club. Being highly competitive she was drawn to lifesaving and soon found it was a sport she really enjoyed. At school, she did well at waterpolo but was forced to make a hard choice. "I left school so that I could go to the World Waterpolo Championship. In those days you had to pay to compete for New Zealand"
Her marathon swimming career coincided with the period Phil Rush was hugely successful. His success generated a number of events, including the Cook Strait Relay, which had a high profile. Ann competed in that as well as a race across Wellington Harbour. It is not only as a participant that Fowler made her mark. She spent more than 20 years as the sports co-ordinator at Chilton St James School in Lower Hutt. Helping develop talent gave her a lot of pleasure and some of the girls she worked with went on to big things, particularly New Zealand hockey player Honor Dillon, who married Dan Carter. Other notables included Melanie Cleland (running), Laura Robertson (orienteering), Emily McGill (swimming), Rebecca Keat (triathlons), Lucy Garner (athletics, volleyball) and Briar Palmer (football). At 55, Fowler still enjoys running and playing social volleyball, and recently took up golf. "It is the most frustrating game in the whole wide world but is fun"
﻿﻿Recognised for his outstanding contribution to Rugby. Basketball team. A star athlete with many options to choose from. Ultimately it would be our National game Rugby where Andys ultimate legacy would be etched in history in what would prove to be a storied career of stunning accomplishments. Andy won the Jubilee Cup 8 times with Petone, he and his son Martin are the only father and son to have played over 100 games of senior Rugby for Petone. His other son John Captained Otago and both boys would play International Rugby for Scotland. Andy represented Wellington for 13 seasons winning the Ranfurly Shield for the Province he eventually Captained and then Coached. It was inevitable that he would wear the All Black jersey 34 times including 10 Tests and was All Black Captain for 33 games. His all round ball skills and athletic ability redefined the role of the Number 8 in our game and much of what we do now in the All Black team Andy was doing in the 1970s. He was years ahead of his time. In 2001 he was made a Member of the New Zealand Order of Merit in the Queens Birthday Honours. And in 2007 he was elected President of the New Zealand Rugby Union. Your patience, leadership, understanding and sportsmanship are virtues and qualities we all try to live our life by. Andy your whole life has been dedicated to making every young kid believe that dreams can come true if you work hard. 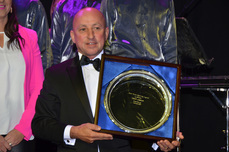 ﻿﻿Recognised for his outstanding contribution to Horse Racing. Born and schooled in Lower Hutt he rode into the Hutt Valley Sporting Legends on the back of an amazing career as a Jockey. Now retired his rise to the top of Australasian racing began with his win on Kiwi in the Wellington Cup in 1983 and of course his amazing follow up win again on Kiwi in the Melbourne Cup. Subsequent rides included wins in the 1987 Melbourne Cup followed by the Cox Plate in 1988 through three Australian Derby’s 1990, 1993 and 2009 through 100 Group one races and a place in the New Zealand and Australian Racing Halls of Fame.